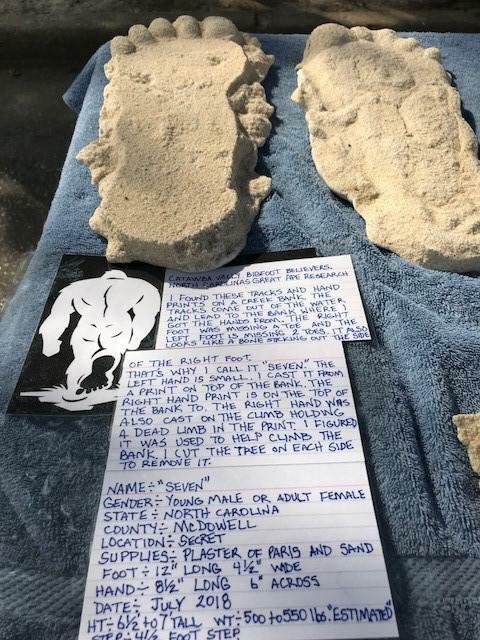 Bigfoot casts for "Seven" on display at the Bigfoot festival in Marion, N.C. on Saturday. Thousands of visitors came to Marion, N.C. for the city's first Bigfoot festival Saturday. Bigfoot hobbyist Lee Woods displays a Bigfoot footprint cast. People from across the country gathered this weekend in a small Carolina manufacturing town to celebrate Bigfoot. 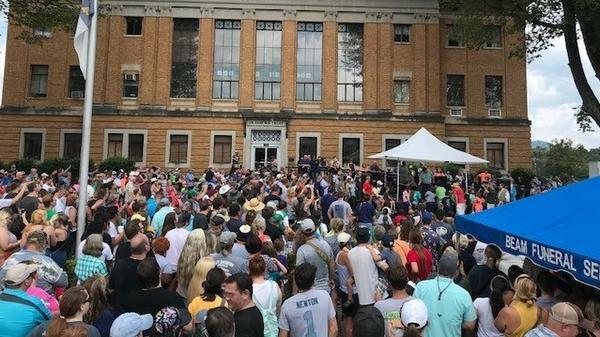 The first annual Bigfoot Festival in Marion, N.C. brought together the entire range of participants from sasquatch skeptics and complete nonbelievers to Bigfoot explorers quick to share tales of sightings and howls. McDowell County Chamber of Commerce director Steve Bush is ambivalent when it comes to Bigfoot. "I'm going to say that until I see him — I want to believe, but until I physically see him — I'm going to say no at this point," says Bush. But, personal skepticism aside, Bush says he was quick to support the Bigfoot festival. This is a city in transition, with old furniture factories and textile buildings downtown retrofitted into hip retail shops and microbreweries. "We're getting a lot of life back into these old buildings, and that's what's exciting about Marion," Bush says. "So, if you really want to see a little bit of the old mixed with the new, then Marion, North Carolina is the place you want to be." At first glance, it's pretty much what you'd expect from a cute Bigfoot festival. There are Bigfoot T-shirt booths, yard signs — but then there's the Bigfoot Juice stand run by Allie Webb. She claims the earthy, woodsy-smelling concoction is both an insect repellant and a Bigfoot attractant. "I believe that the Bigfoot juice does work," says Webb. "We say that it's good for up to a mile and a half away. Just because you don't see Bigfoot doesn't mean that he didn't see you and decide to turn around and run." Webb's also quick to point out that she has a witness. Festival organizer John Bruner has led the Bigfoot 911 explorer team for years here. He says they used the juice about a year ago and finally hit pay dirt. "We were doing an expedition and I had one cross the forest service road about 30 yards from where I was at, and I got a really good look at it," Bruner says. "I've been hunting Bigfoot for 40 years and doing research — and it was just totally exhilarating for me. ... I finally got to see one after all I've went through and all the time I've spent in the woods." It's a sentiment shared by many other researchers here at the festival, like Lee Woods. "The female we saw probably right between 11:30 and 11:45 at night. And we saw her with some night vision. And that was the first one I'd ever seen," says Woods. Years later, he claims to have seen a male sasquatch, some 9 feet tall. "And once you see it, it's ingrained in your brain. Trust me [laughs]. Yeah, you don't forget it. The reason I say that is the guy who actually saw it with me — his name is Sam, and he's ex-Marine — and he said he'd never been so scared in his whole life when he seen it. And he's never came back. Yeah, that's how scared he was." Woods stands behind a booth alongside other experts, answering festivalgoer questions, displaying Bigfoot photos, casts and even field recordings of strange sounds in the woods. According to Bigfoot researcher Bob Trent, they may be the sound of a sasquatch crying out, or not, but he says they have been unable to classify them any other way. He and his team, The Dirty South Squatchers, use modified digital recorders with long-lasting batteries. They're carefully hidden, recording forest sounds for up to 15 days at a time. For many here at the festival, the Bigfoot calling competition will be the high point, for seasoned hobbyists like Woods and for sasquatch newbies like Irys Frankon. She and her family drove from Clarkesville, Ga.
"Because we're still trying to find out if he's real or not," Frankon says. "And there's possible sightings everywhere to be totally honest. And we just still believe in him. And we can eventually get one." At the Bigfoot calling competition, Frankon, along with dozens of others steps up to the microphone in front of City Hall one at a time. They belt out their best cry of the sasquatch with hopes of luring a Bigfoot out of the forest and onto Main Street. Eventually Bigfoot calling champions were announced and the daylong festival wrapped up. There were no Bigfoot sightings, but stories were shared, thousands and thousands showed up for the occasion, and more than one sasquatch skeptic was converted. The lore lives on. Copyright 2018 88.5 WFDD - Public Radio For The Piedmont. To see more, visit 88.5 WFDD - Public Radio For The Piedmont. 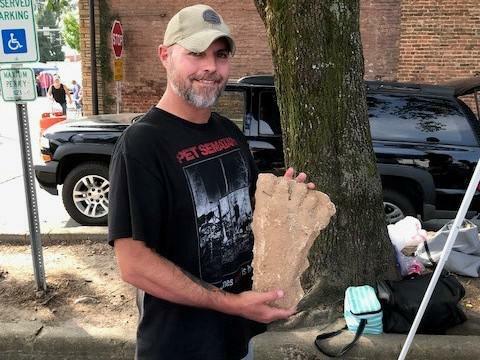 People from across the country gathered this weekend in a small North Carolina manufacturing town to celebrate Bigfoot. The first-ever Bigfoot Festival in Marion, N.C., brought everyone out from Sasquatch skeptics to yeti explorers quick to share tales of sightings and howls. From member station WFDD in Winston-Salem, David Ford reports. DAVID FORD, BYLINE: Marion's Chamber of Commerce Director Steve Bush is ambivalent when it comes to Bigfoot. STEVE BUSH: I'm going to say until I physically see him - I want to believe. But until I physically see him, I'm going to say no at this point. FORD: But, personal skepticism aside, Bush says he was quick to support the Bigfoot Festival. This is a city in transition, with old furniture factories and textile buildings downtown retrofitted into hip retail shops and microbreweries. At first glance, it's pretty much what you'd expect from a cute Bigfoot festival - yeti T-shirt booths, Sasquatch yard signs. But then there's the Bigfoot juice stand run by Allie Webb. She claims the earthy, woodsy-smelling concoction is both an insect repellent and a Bigfoot attractant. ALLIE WEBB: I believe that the Bigfoot juice does work. We say that it's good for up to a mile and a half away. Just because you don't see Bigfoot, doesn't that mean that he didn't see you and decide to turn around and run. FORD: Webb's also quick to point out that she has a witness. Festival organizer John Bruner has led the Bigfoot 911 explorer team for years here. He says they used the juice about a year ago and finally hit pay dirt. JOHN BRUNER: We were doing an expedition. And I had one across a forest service road about 30 yards from where I was at. And I got a really good look at it. BRUNER: I've been hunting Bigfoot for 40 years and doing research. And it was just totally exhilarating for me. And it was kind of like - you know, I finally got to see one. After all I've went through and all the time I've spent in the woods, I finally got to see one. FORD: It's a sentiment shared by many other researchers here at the festival, like Lee Woods (ph). LEE WOODS: The female we saw probably right between 11:30 and 11:45 at night. And we saw her through what's night vision. And that was the first one I'd ever seen. FORD: Woods stands behind a booth alongside other experts answering festivalgoer questions, displaying Bigfoot photos, casts and even field recordings. FORD: That may be the sound of a yeti crying out, or it may not. Teams here use modified digital recorders with long-lasting batteries. They're carefully hidden - recording forest sounds for up to 15 days at a time. For many here at the festival, the Bigfoot-calling competition will be the high point for seasoned hobbyists, like Woods and for Sasquatch newbies like Irys Frankon (ph). She and her family drove from Clarkesville, Ga.
IRYS FRANKON: Well, because we're still trying to find out if he's real or not. And there's possible sightings everywhere, to be totally honest. And we just still believe in them. And we could eventually get one. FORD: Frankon hopes to call Bigfoot out of the forest and onto Main Street. UNIDENTIFIED PERSON: What is your name, young lady? UNIDENTIFIED PERSON: Irys, have you been working on a call? UNIDENTIFIED PERSON: All right. Here we go. FORD: Eventually, Bigfoot-calling champions were announced, and the daylong festival wrapped up. There were no Bigfoot sightings, but stories were shared. Thousands and thousands showed up for the occasion. And more than one Sasquatch skeptic was converted. The lore lives on. For NPR News, I'm David Ford in Marion, N.C.
(SOUNDBITE OF MIJA'S "NEVER B ALONE") Transcript provided by NPR, Copyright NPR.